I have a little obsession with purses. The size of my personal collection is teetering on what can only be defined as insane. They’re like little works of art that instantly transform an outfit. 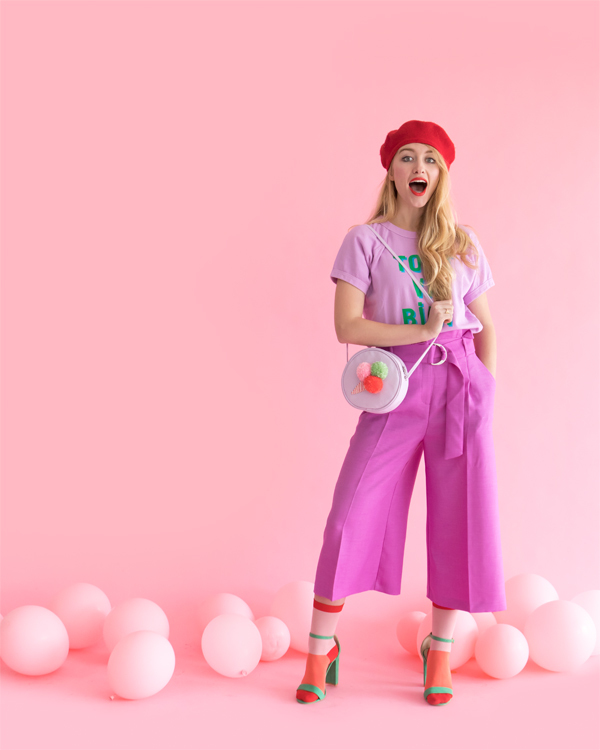 I particularly like ones that are a little bit quirky- they can either provide a cute, graphic aspect to an already colorful ensemble or be a statement piece that adds a surprise element to a more minimal outfit. 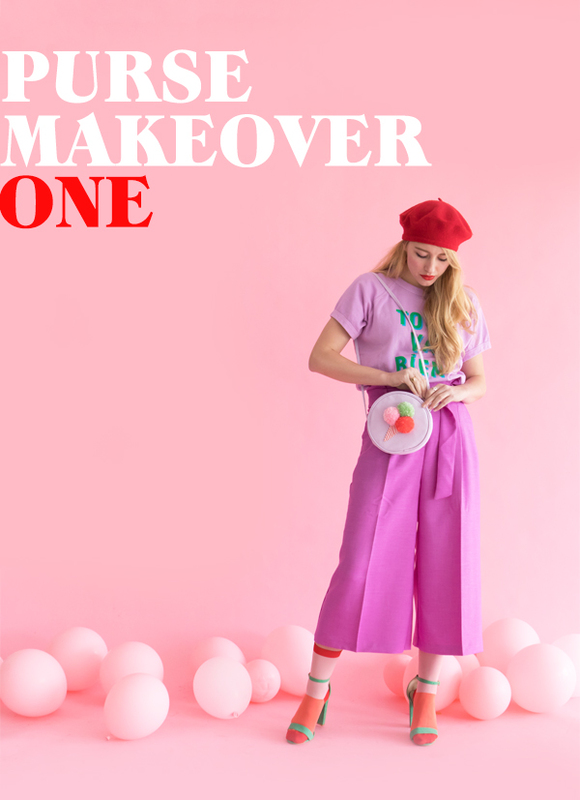 There are so many great purses out there, available at ‘aspirational’ prices, so we thought we would find out how easy it would be to makeover 3 inexpensive and basic pieces. Click through to see our first project! We started with this simple, canvas round Baggu cross body but you can find an even cheaper version of a round bag right here. Round bags are definitely having a moment. I’ve been seeing a lot of pom pom ice-cream tees and sweatshirts at the moment and thought it would be cute to design my own version on a purse. Step 1: Start by making the pom poms. Cut a small piece of cardboard and wrap the yarn around it. Once you have a thick layer of yarn, take it of the cardboard and tie a knot in the middle of the bundle. Cut the sides of the bundle and then start to trim it down, until you get the right size and a nice round shape. 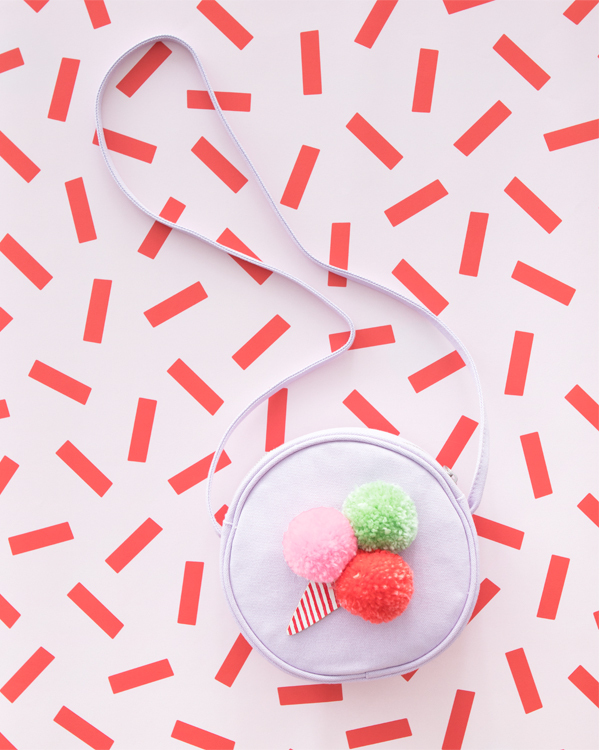 To make it easy to attach to the clutch, cut out a small round circle of felt, and hot glue it on to the pom pom. Step 2: Take a small leather piece and paint a layer of white acrylic paint as the base. Once dry, start to gently paint the red stripes with a small brush. After it’s all dry, cut out a triangle as the cone of the ice cream. Step 3: Place elements on the bag and attach all the pieces with fabric glue. Let set before using! My ice-cream obsessed daughter would love this!